To my old friends and new followers: hi & welcome! Glad to have you here! My name is Joi and I blog here at Nuestra Vida Dulce about all of our DIY adventures and my little family. My husband and I are both high school teachers and we have a two year old little spunky monkey named Theron. He definitely keeps David and me on our toes at all times. If you follow me [@joidan82] on IG you already know that I am mildly obsessed with dressing my little guy! It's more fun than I would've ever imagined and I get a kick out of seeing him in all of his little outfits! 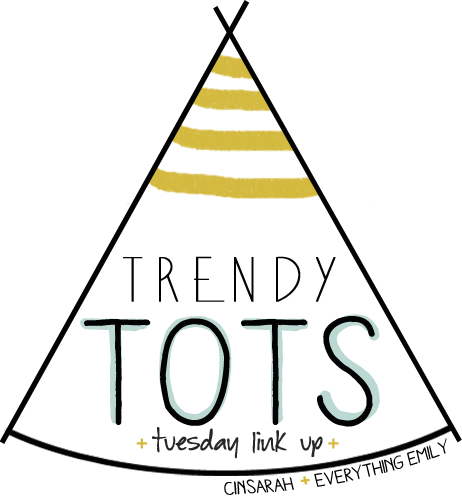 I've met some pretty sweet and cool mommas via Instagram and have the opportunity to help two of them, Cindy & Emily, host their monthly trendy tot party! I am a big fan of mixing prints and try to add in as many layers as I can, as long as he's still comfortable! He's been pretty fascinated with sticks here lately and always has one in his little hand! I hope you'll participate so I can see some more momma blogs! Thanks, everybody! Don't forget to visit each of the hosts and co-hosts as we will each be featuring photos of our own kiddos. Make sure to visit Cindy's and/or Emily's blog to enter to win $30 in shop credit to Loved by Hanna and Eli. I just love that little boy and his outfits are always so fashionable - just like his momma.